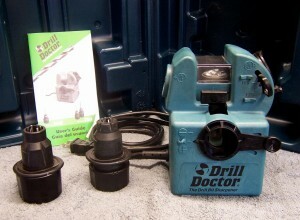 This is a review of the Drill Doctor model 750 drill bit sharpener. Not that long ago the 750 was Drill Doctor’s top of the line model until it was replaced by the 750X, which you can buy new for about $140. I’ve seen videos of the 750X in operation and although it looks different, I believe it works in the same way, so you may find this review useful if you are thinking about buying the newer model. You may also find this review useful if you are considering a Drill Doctor 500X or a used model 500, which was its predecessor. The main difference is that the 750X and 750 come with an extra chuck that allows you to sharpen bits up to .75-inches in diameter. The 500X/500 can only sharpen drill bits up to .50-inches in diameter unless you buy the larger chuck separately as an accessory for about $40. The 750X and 700 are also the only models that come with a carrying case, although you can buy one for the other models as an accessory. I have heard that a good machinist should know how to sharpen a drill bit by hand, without a jig or fixture of any kind. That’s probably true, but I am a mostly self-taught home machinist with no one who can show me how to do it. I have tried it a few times but each attempt was a complete failure and I would have been better off continuing to use the dull bit. I have also heard that even if you can hand grind a bit, it is hard to grind both flutes evenly so they will drill a round, exact-sized and straight hole. Putting a split point on a drill bit is suppose to be even harder and requires a grinding wheel with a sharp, not rounded, edge. Buy new ones – This may be a good solution for many home machinists. I got started about two years ago with a set of Harbor Freight drill bits that cost me less than $20 and they have worked pretty well. I am still using them and I bought a spare set to use as replacements if they become too dull or I break one. I also considered buying individual high quality replacements for them as they wore out. Send them out for sharpening – I’ve heard it costs between $1 and $2.50 per drill to have them professionally sharpened. I am not going to spend that kind of money to sharpen inexpensive HF drills, although I might if I had a nice set of cobalt bits or if I used larger diameter bits (5/8-inch or bigger). Buy some kind of sharpening machine or jig – I can’t afford even a used commercial quality tool grinder like a Darex. That left either buying or making some kind of device for holding a drill at the proper angle against a grinding wheel, or buying a Drill Doctor or some other drill bit sharpener that is affordable enough for a home/hobbyist machinist. I decided I wanted a Drill Doctor because they got great customer reviews on Amazon.com. When someone did badmouth it, it often seemed like it might be because they hadn’t learned to use it properly by reading the instructions or watching the video that came with it. Cost was an issue for me. A new 750X costs about $140 and the 500X is about $30 less. That’s a lot of money to spend just to sharpen some drill bits. Especially if you have a limited budget and there are more important things your workshop could use. In my case, that would be a rotary table. So I waited patiently for more than a year for a Drill Doctor in very good or better condition to show up on Craigslist. I finally bought a model 700 in excellent condition for $65. The 700 (and 750X/500X/500) can sharpen most twist drills with a 118º or 135º point angle. All four models can grind a standard point or create a split point bit. They can also sharpen masonry drills and even sharpen left-handed drills if you buy a special $40 chuck. All four can handle drills from 3/32 to 1/2-inch in diameter. But as I mentioned earlier, only the 750x and 700 come with an extra chuck that allows them to sharpen drills up to 3/4-inch. The diamond grinding wheel is capable of sharpening bits made out of carbon steel, HSS, cobalt and carbide. It will not sharpen brad point bits. I haven’t tried to sharpen a masonry bit yet, but here is how you sharpen a twist drill. The drill bit is held in a round chuck that has flats on it and a cam. The flats are used to align the chuck in the sharpener’s three ports, which will ensure that the drill’s flutes are correctly aligned with the diamond sharpening wheel. To begin, you put the drill bit in the chuck and tighten it, but leave it just loose enough so you can slide and rotate the drill in the chuck. You then put the chuck in the alignment port while holding the alignment lever open. Next, you then push the bit against a depth stop and release the lever. Releasing the lever closes a clamp around the bit. You rotate the drill bit until you can see and feel the clamps hold the bit at its narrowest point. Then tighten the chuck completely so the bit can not move. This process is not hard, but it is the most important part of the operation. What you are doing is setting the distance that the drill extends out of the chuck and aligning the drill’s flutes with the flats so they will be ground properly in the sharpening and split point ports. The chuck is then removed from the alignment port, plugged in the sharpening port and the motor turned on. Next turn the chuck clockwise for an even number of half-turns. During each turn the cam on the chuck briefly causes the drill bit to come in contact with the diamond wheel, sharpening the bit. You want to do this an even number of times so each flute is sharpened equally. The number of turns required depends a great deal on the size of the bit. According to the owner’s manual, a 3/32-inch bit may take 2-4 half-turns while a 3/8-inch bit might take 16-20 half-turns. It’s easy and takes very little time. At this point you will have a sharp drill bit with a standard point. You can now add a split point if you want by taking the chuck out of the sharpening port and putting it into the split point port. The manual then says you should then “gently tap the bit against the sharpening wheel twice.” You then remove the chuck, turn it 180º and repeat the process. What you are doing here is touching each side of the drill bit to the diamond wheel’s edge to create the split point. This is the only thing about the Drill Doctor model 750 that I can really criticize. For a perfectly centered split point you need to tap each side of the point equally. I’ve had good luck doing this so far, but it could be a problem. Apparently the newer 750X addresses this issue by adding a stop that ensures each side is split equally. The Drill Doctor doesn’t make much noise or vibration, and it will make even less if you operate it on a folded-up cloth shop rag instead of a hard surface. It did not take much practice before I learned how to sharpen and split the point of a drill bit in less than two minutes. The Drill Doctor is mostly made of plastic. I would not let that bother you. Its parts are robust and look like they will last a long time. I don’t know about their cost, but it looks like replacements are available if you should need them. I do know that a new chuck costs about $40. The grinding process creates grit that can cause the moving parts in contact with each other to wear out more quickly. So the owner’s manual recommends that you clean it after sharpening 20-25 drills. It does not take long and is not hard, although you do need to be a little careful when reassembling the chuck. The outside of the chuck is plastic but the inside has six metal jaws that fit into small slots. The owner’s manual says that the diamond wheel will last an average of more than 200 sharpenings, and if you don’t sharpen bits bigger than 1/2-inch you can double its life by turning it upside down. If that’s true, and I believe it is, then the operating cost will be about 5 to 10 cents per drill. A new diamond wheel, which is very easy to install, costs about $20. It probably won’t last that long if you sharpen mostly larger diameter drills because they will cause the wheel to wear out faster. The Drill Doctor appears to be well-designed, well-made and it will probably last a long time. It quickly, easily and correctly sharpens drill bits, just like the manufacturer says it will. Its biggest drawback is its cost. The Drill Doctor can probably quickly pay for itself in a production shop that spends a lot of money buying new drills instead of sharpening old ones. But it could take years for a Drill Doctor to earn back its cost in a home workshop. Of course hobbyists don’t always take cost into consideration when they want to buy a new tool. And there is a certain pleasure that comes with using a nice sharp drill bit. Let me know if you have any questions. I’ll try to answer them. Disclaimer: Information about the model 750X and 500X came from the Drill Doctor web site. I believe I have passed it on correctly but you may want to verify it before buying one because of this review. I’d just feel the wheel, but not when it’s turned on 🙂 If parts of it feel much smoother then the rest then it’s probably worn out. But you don’t necessarily have to buy a new one. You can flip your wheel upside down to expose a fresh surface unless it was used to sharpen bits bigger than 1/2-inch. BTW, you may find it helpful to look at the instructional videos on YouTube or the Drill Doctor web site. They all work pretty much the same way, even the older 750 and 500 models. Thanks for taking the time to pen this great review. I think there’s a lot of value in having something like a Drill Doctor on hand, even if the cost won’t be recouped by the average home machinist. There is nothing more frustrating than starting work on a project only to find that the drill size you need happens to be dull. Also, I have a lot of drills handed down to me by my father, and it would be nice to put those old bits back in service. I bought a used one of the smaller models (350?) from an eBay auction a few months back. Quite frankly, I was expecting a piece of junk for the price I paid. Upon delivery, I opened it up and read the instructions. I took a cheap chinese made drill bit that hadn’t cut well even when new, and was now very dull. Chucked it up, ran it against the wheel a few times then took it out. I was pleasantly surprised at how well it was sharpened, and that the flutes were now even. Trying it out on a random piece of CRS, it cut cleanly and quickly without even center drilling first. I would highly recommend that any hobbyist have one of these for resharpening drills. It takes seconds to dress a bit, and works as advertised. My only regret was not buying one of the larger models, as I am limited to sharpening smaller bits. Thanks for the very complete review. I have a 750X which is now about two years old. The diamond (180 grit) wheel was replaced last week. Works well up to about 3/8″ dia. drills but larger: not so well. Big problem is the split point. A drill so worked just sits there unless heavy force is applied then the chips are like heavy dust. Using the final step apparently gives a tip which has no cutting edge. I worked on a ‘U’ drill (0.368″) for about an hour trying different settings with same result. A relatively cheap HF drill without the split point or benefit of the 750X cut right into the steel. Any thoughts will be appreciated. Hey Al, I had this problem and contacted the maker. They recommended I use the 118 degree setting (at the front of the machine) instead of 135. This leaves more clearance angle behind the cutting edge. Then just split the points as usual. This works well. Give it a try. Having amassed a large quantity of dull bits, myself, and tired of buying new ones in the same size, I bought a drill doctor. It is cheaper than buying more bits, and the ones I do have are now usable. My Drill Doctor is the economy size 350 model. Paid $35.00 at HD about 8 years ago. Works well, probably need a new wheel by now as sometimes I have to free hand more relief on larger drills. You can sharpen very small drills too, smaller than 3/32″. I have made several small drill holders from scrap 1/4″ round stock.I bore holes in each end of a 1/4″ x 5″ round stock scrap.The holes are one or two sizes larger than the drill I want to sharpen.If I want to sharpen a #50 drill the bore will be #52. I also drill and tap a hole in the side for a setscrew.I generally use 1/8’x5/44 set screws. The dull drill is locked into the holder with the set screw, installed into the Drill Doctor the same way a large drill bit is done. Then sharpen the small bits.Check after two revolutions as the small bits grind quickly. I use a lot of smaller number drills and came up with this idea to save time. I have tried to sharpen bits as small as #57. These very small bits are a crapshoot. The fingers that hold the flutes in place as you tighten the chuck are too thick for these very small drill bits. I can sharpen them sometimes,mostly guesswork as I cannot feel the fingers click.If you study the relationship of the flutes to the chuck on a larger drill and try to replicate it on the tiny drills you may have success grinding small drills. Look at the thing … cheap plastic … not even high grade plastic. The plastic gives while you’re trying to sharpen the bit and allows the bit to wander. I ruined several expensive drill bits with this little piece of junk. Avoid it. Good product easy to use, consistent results. Not that great on the smaller bits, 1/8 too 3/4 excellent. Not worth the trouble to do the smaller ones. It has been my experience that on the smaller bits (less than 1/8″) you have to pay particular attention to the orientation of the bit in the chuck. I also find it pretty hard to get a good point on the really small bits (under 1/32″) consistently. Trial and error usually does the trick, but it’s frustrating to have to regrind several times. That said, I like mine well enough to purchase a second one from eBay this week. The Drill Doctor is a Quack. Watch eBay for a Black & Decker model: 4300, DeWalt model: DW751 or the same machine sold under the Craftsman brand. I’m a machinist with 50+ years in the trade so I know a little bit about drill bits and how to sharpen them. With age my eyesight went south so I could no longer sharpen drill bits by hand. I bought a clean B & D 4300 machine for $150.00 and liked it so well that I watched for another one. A few weeks ago I scored a brand new never used B & D 4300 for $99.00. They show up frequently on eBay but don’t buy a junker because there are no parts. The flute index is a perishable part and they are hard to find but they are also on eBay. Oh Darn, I forgot why I was on this site. I’m considering using the motor and grinding wheel out of a Quack Drill Doctor to build a sharpener tungsten sharpener for TIG welding. I need to know the diameter of the grinding wheel. …time is life. Killing time is murder.